AUTO SUPPLIER REVS UP PRODUCTION WITH HAMILTON. Other Specifications: Each features two carousels that lock in place during transport. Locomotive mfg. stays on track with Hamilton. Other Specifications: A staggering 24-feet long and 10-feet wide. Hamilton fuels oil & gas industry. Other Specifications: Features beefy 8" by 3" dual cast nylon wheels. Automotive cuts costs with Hamilton trailers. Other Specifications: Custom three-tier rotating carousel makes part distribution a breeze. Distribution centers rely on Hamilton trailers. Other Specifications: 20-foot-long trailers connected by heavy-duty couplers. Hamilton handles the pressure in material handling’s heaviest, grittiest and most complex jobs. ...including custom massive trailers that haul up to 60 tons of wing, fuselage and rudder for a major aerospace manufacturer, and platform trucks that help a leading package delivery & logistics corporation ship millions of packages. Riding on our legendary industrial casters and backed by an industry leading three-year warranty, many carts in our stock line ship PRONTO® for lightning fast delivery. 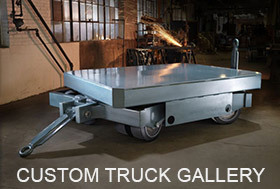 And for unconventional applications, we specialize in custom-engineered carts and trailers to haul just about anything.